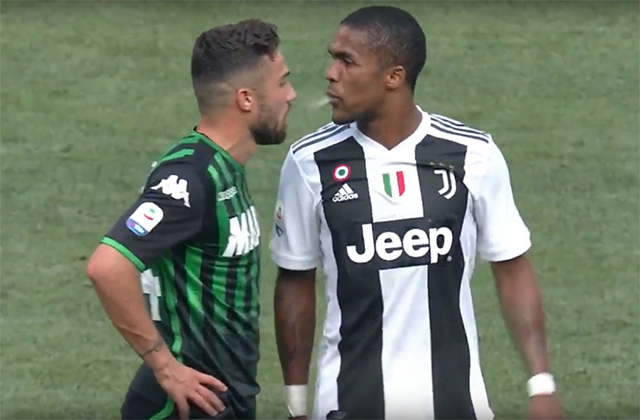 Juventus winger Douglas Costa has found himself at the centre of a huge storm after appearing to spit in the mouth of his opponent. Cristiano Ronaldo broke his drought with a brace in Juventus' 2-1 win over Sassuolo on Sunday, but the victory was somewhat overshadowed by Costa's red card in the final minutes of the match. Costa completely lost his head and got into a tussle with Federico Di Francesco who he elbowed before attempting a headbutt. The 28-year-old Brazilian then appeared to spit into Di Francesco's mouth from point-blank range. The incident was caught on camera and the VAR booth immediately alerted the referee, who sent Costa off for unsportsmanlike conduct. Video of the incident stunned football fans everywhere, and sparked an angry reaction from Juventus boss Massimiliano Allegri. Maybe he was irritated at a foul before, but it doesn't matter, because this absolutely must not happen. The one thing we must avoid doing is falling for provocation. We could've scored a third goal, but instead we started to play as individuals, we tried to dribble past everyone, this wound up the opposition, who then reacted badly and you get to situations like Douglas Costa. The former Bayern Munich man has since taken to Instagram to apologise for the unsavoury incident. I want to apologise to all the Juventus fans for this over the top reaction I had during today's game. I also apologise to my teammates, who are always by my side, in good and bad times. It was ugly, I am aware of that and I apologise to everyone for that. I want to make clear that this isolated conduct has nothing to do with what I've shown throughout my career. There is no mandatory ban in Serie A for spitting at opponents, but Costa will be expecting to get a huge amount of fine for his disgraceful behaviour.